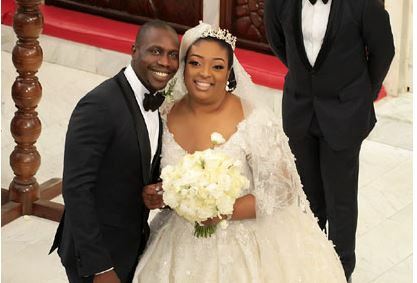 The one-year-old marriage between Olujonwo, the son of former President Olusegun Obasanjo, and Temitope, daughter of Lotto boss, Chief Kessington Adebutu aka Baba Ijebu, is in crisis, as the husband has dragged the wife to court over threat to his life. According to some documents we obtained today, trouble started few days after their wedding in May 2017, when Olujonwo noticed that Temitope was acting strangely. According to one of the documents, when he approached her to find out what was happening, he received two slaps and the wife became even more aggressive, later that day. Olujonwo’s mom had, in February 2018, raised an alarm that her son had left their matrimonial home and ha gone into hiding over the way his wife was treating him, an allegation that Olajuwon debunked, but the mom insisted that it was true and that his son was being manipulated. Having had enough, now Olujonwo has officially written the Ogun State Judicial Service Commission, to detail his ordeal and has also dragged Temitope before a Lagos State Magistrates Court. The court summons was recently posted at the entrance of her house.